Lynch, Marc 2016. Political Science in Real Time: Engaging the Middle East Policy Public. Perspectives on Politics, Vol. 14, Issue. 01, p. 121. Autesserre, Séverine. 2010. The Trouble with the Congo: Local Violence and the Failure of International Peacebuilding. Cambridge: Cambridge University Press. Christia, Fotini. 2012. Alliance Formation in Civil Wars. Cambridge: Cambridge University Press. Driscoll, Jesse. 2012. “Commitment Problems or Bidding Wars? Rebel Fragmentation as Peace Building.” Journal of Conflict Resolution 56(1): 118–49. Gibson, Clark, Andersson, Krister, Ostrom, Elinor, and Shivakumar, Sujai. 2005. The Samaritan's Dilemma: The Political Economy of Development Aid. Oxford: Oxford University Press. Joint Staff, The, J7. 2012. Joint and Coalition Operational Analysis, June 15. In Decade of War, Vol. 1: Enduring Lessons from the Past Decade of Operations. Kalyvas, Stathis. 2003. “The Ontology of ‘Political Violence': Action and Identity in Civil Wars.” Perspectives on Politics 1(3): 475–94. Krause, Peter. 2013. “The Structure of Success: How the Internal Distribution of Power Drives Armed Group Behavior and National Movement Effectiveness.” International Security 38(3): 72–116. Robinson, Linda, Miller, Paul D., Gordon, John IV, Decker, Jeffrey, Schwille, Michael, and Cohen, Raphael S.. 2014. Improving Strategic Competence: Lessons from 13 Years of War, RAND (RR-816-A). Staniland, Paul. 2012. “States, Insurgents, and Wartime Political Orders.” Perspectives on Politics 10(2): 243–64. Sullivan, Patricia. 2012. Who Wins? Predicting Strategic Success and Failure in Armed Conflict. Oxford: Oxford University Press. Toft, Monica Duffy. 2010. “Ending Civil Wars: A Case for Rebel Victory?” International Security 34(4): 7–36. Walter, Barbara. 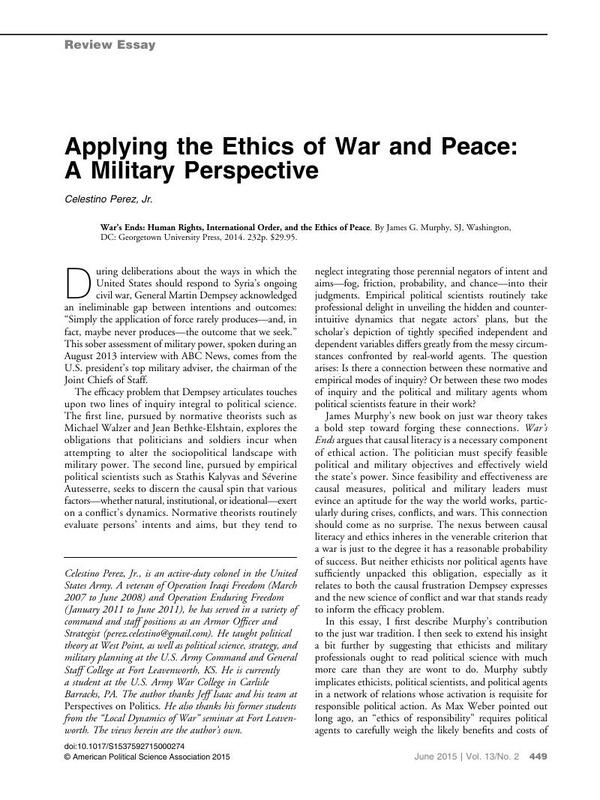 N.d. “Why Bad Governance Leads to Repeat Civil War.” Journal of Conflict Resolution. Forthcoming.